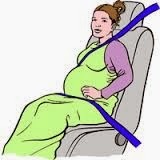 Home / Do's and Don't's / Hows and Whys / Car Seat Belt During Pregnancy..
Is itsafe to use a seat belt during pregnancy? Absolutely! In fact, it's dangerous not to. Research has repeatedly shown that the best way to protect your growing baby is to protect yourself: Wear a properly positioned safety belt each and every time you're in a car or truck. To avoid injuring yourself and your baby, though, the seat belt must be properly fastened. Thelap belt should be secured below your belly, low and snug on your hipbones. Never wear the belt across or above your belly. During a crash, the sudden jolt from a belt in this position could cause the placenta to tear away from the uterus. If possible, warm up the inside of your car before heading out in cold weather. That way you can take off heavy winter coats and sweaters, which can cause the seat belt to slide up on your belly. Always use the shoulder belt, too, which should fit snugly between your breasts. If the shoulder belt cuts across your neck, re position your seat or the belt so it fits better. Do not place the shoulder belt under your arm or behind your back. When you're driving, adjust the front seat so it's as far away as possible from the steering wheel and dashboard while still allowing you to reach the pedals comfortably. By the way, if you're in a car accident — even a minor one and you feel just fine — you should see your healthcare provider without delay so she can make sure that both you and your baby are unharmed.